If store shelves are a holiday harbinger, Thanksgiving has become the forgotten one! By early October, Christmas merchandise starts sneaking onto the shelves and completely takes over immediately after Halloween. You’re lucky to find a few Thanksgiving or harvest items languishing in a corner or on a hidden shelf. Even with all the Christmas hype, there’s still time and opportunity for Thanksgiving in the classroom… learning about the history of the first Thanksgiving, contrasting the differences between long ago and today, and focusing on gratitude. Oh, and don’t forget to have a little turkey fun! I was surprised to discover that Turkey Lover’s Day is the third Sunday in June with June designated as Turkey Lovers Month. 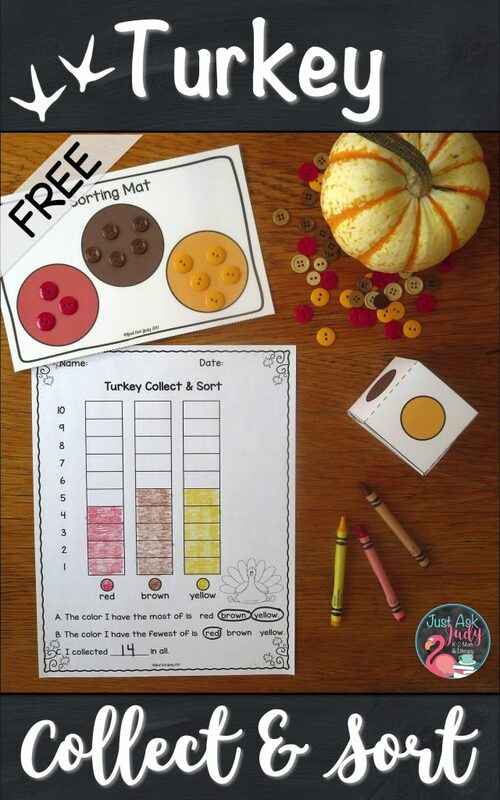 I adore this Turkey Collect & Sort activity for several reasons. The same activity can be used to focus on different skills with different kids. It is relatively easy to prepare. This is a hands-on learning activity designed to engage. This activity can be repeated across the seasons with different themes. 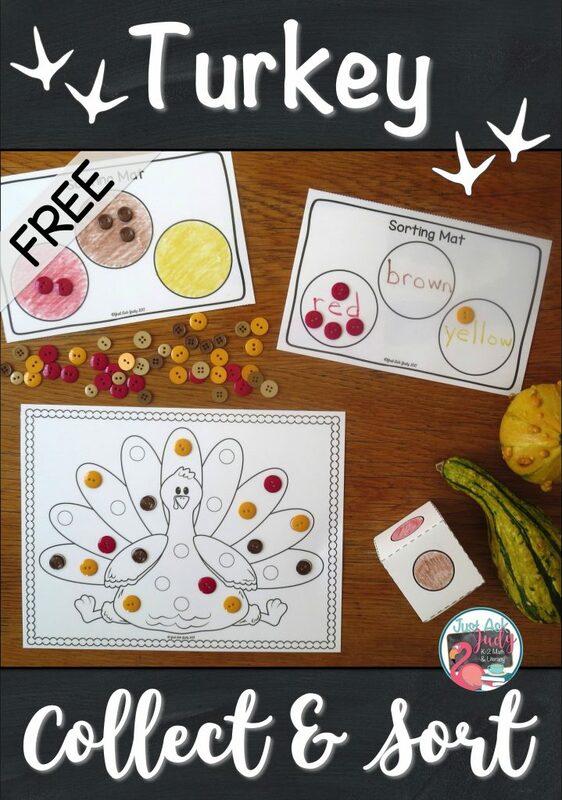 Turkey Collect & Sort, a free download, is a partner activity crafted to engage preschoolers, kindergarteners, and beginning first graders on several levels. Your youngest learners can enhance their fine motor skills and match/ identify colors. Older learners can count, write numbers, represent quantities with ten frames and tally marks, graph, and compare quantities. Decide on a spinner or a cube. Print and cut. Color the black and white, if using. The spinner can be made with purchased hands; a paper clip and pencil; or a brad and paperclip. Score, fold and glue the cube. 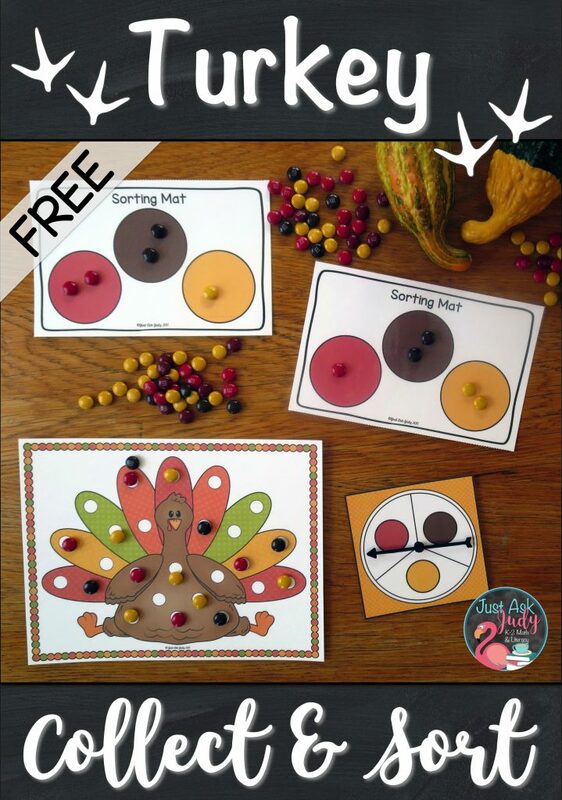 Print one turkey game mat for each pair of players. Pick and print one or both optional recording sheets. Place 25 red, brown, and yellow counters in the spaces on the turkey mat. Follow-up with one or both of the recording sheets. If desired, color the circles to match the color words. Count how many of each color you collected. Write the number. Color spaces on the ten frame to match each quantity. Draw tally marks to match each quantity. Count how many of each color you collected. Color the bars on the graph to match each quantity. Use the data on the graph to complete the statements. Read my blog posts about this same activity with a candy corn or American flag theme. 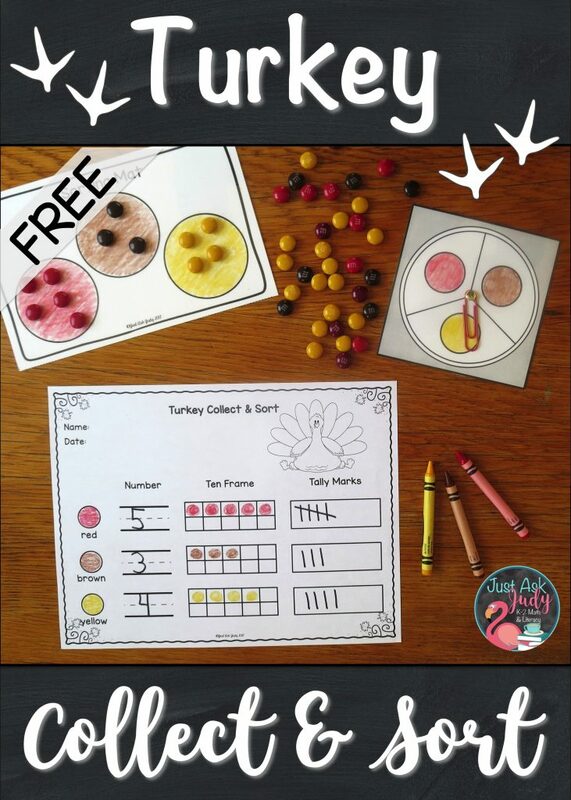 Click on a link below to find more turkey-themed and Thanksgiving resources, suitable for kindergarten, first, second, or third grade, in my TpT store! 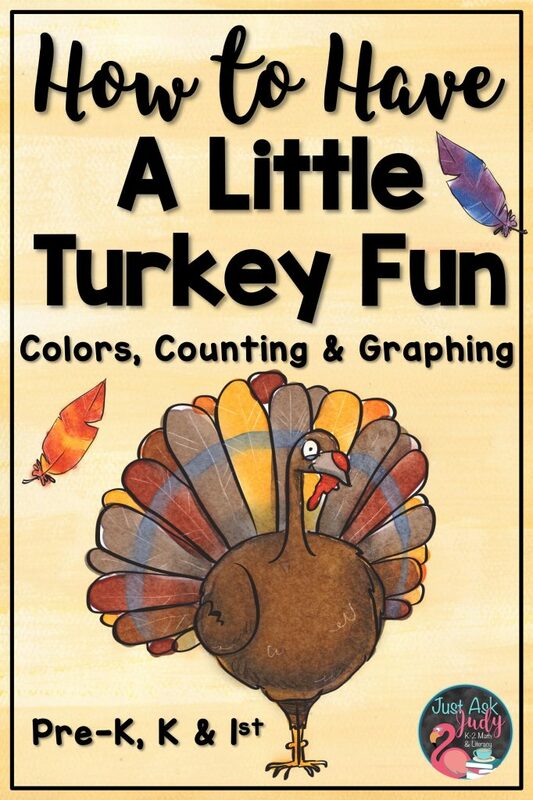 I recently gave the turkey comparison, emergent reader, and sentence construction resources a cosmetic makeover.